Cinesite is heading to FMX 2019 in Stuttgart Germany to discuss opportunities at its studios. The recruitment teams are looking to fill a number of key technical and craft specialised positions to support the exciting projects currently in production. The annual FMX conference represents a unique opportunity for candidates to meet the recruiting teams from all our studios and discuss potential career opportunities. The team will be attending the FMX recruitment fair from Tuesday, 30th April to Thursday, 2nd May. The job fair is held in Eyth-Saal on LEVEL 2. 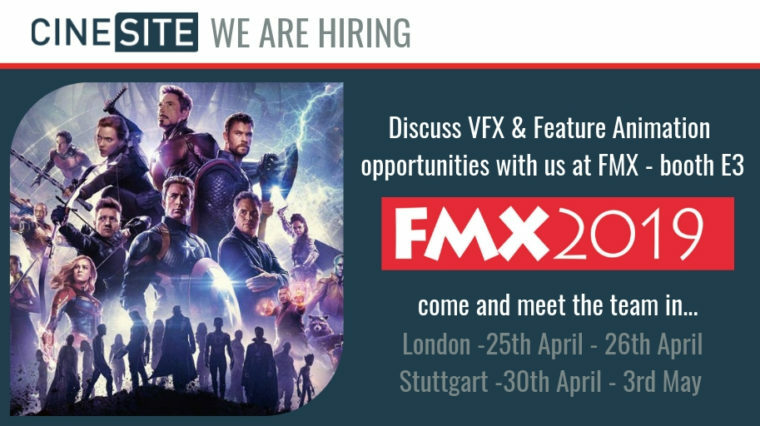 Cinesite’s recruiters will also be holding interviews in London before FMX on the 25th & 26th April . If you would like to arrange a time to meet with us, please apply via this form. We look forward to meeting you!